Fusion Graphix Custom Rim Strip Kits come in 8 pieces to do a complete set of rims . 4 fronts and 4 rears, Each Rim has two pieces per side. They come in long straight strips for ease of printing, installation and shipping. You may choose your background color along with three industry standard logos, Text or upload a *logo to add. If you choose text you can select text style and colors. If you want the industry standard logos to match the color scheme you chose, you may select that as well. Please select from either 1/2 inch Big Bike, 3/8 inch Small Bike or 1/4 inch Mini Bike rim lip size. *Remember these are Rim Strip Decal Kits, if you choose a Vertical proportioned logo it will have to be super small and wont look correct. Please Make sure you choose Lengthwise logos that will flow correctly with the thin strip. If you want a certain look, Text style, color combination or logo combination make sure you explain everything in detail for our designers in the "Additional comments section" on the next step of this process. This is the width of the strip so it will fit on the correct size rim. The length of these strips will be a little longer and some trimming might be needed. This is the background color of the decal rim strip. 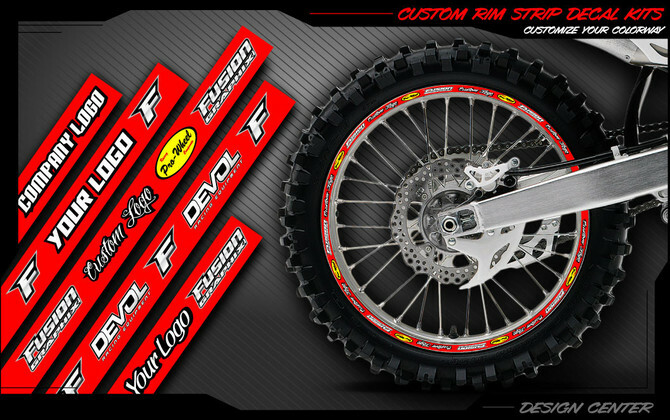 If you chose a Text Option for Rim Logo 01-03 please select a Text Style. If your choosing text option for some of the logos, this will be the inside color of your text. If your choosing text option for some of the logos, this will be the outline color of your text.